Yahoo said today in a regulatory filing that it had hired one of Google’s top sales execs, Henrique De Castro, as its COO. Earlier today, I had reported that CEO Marissa Mayer had been close to nabbing the advertising exec, who has most recently been Google’s president of partners business solutions. De Castro is getting a pile of money for taking the job, including a $600,000 yearly base salary and an annual bonus that could double that figure. In addition, the Silicon Valley Internet giant will give him $36 million in stock grants, including a one-time retention equity award of $18 million and $18 million in the form of performance-based stock options. He is also getting $1 million in “make-whole” cash for forgoing compensation from Google and $20 million in stock to replace his shares at the search giant that will vest over four years. That is a very big check, although Mayer garnered an even bigger one when she joined the company in July. Yahoo’s regulatory statement on the De Castro hiring is embedded below in its entirety, so you can read about his new riches for yourself (unless Yahoo’s persnickety legal head tries to block it). Both Mayer and also former Yahoo CEO Scott Thompson have made previous overtures to nab De Castro, who has held a number of high-level jobs for Google across the globe, including at DoubleClick, in display ads and with major partners. While he had previously rebuffed those efforts, this time De Castro bit. There were signs he might this past week, after De Castro canceled a major offsite for his employees, and several attendees who know him well said he was not present at the company’s first night of its annual Zeitgeist event for advertising and publishing clients. The suave De Castro is usually a more noticeable fixture at such gatherings. This is Mayer’s first big hire at Yahoo, having added only lower-level or less well-known execs to her stable of talent since she was appointed. She touted the hire in a tweet, although the news was long out the door, while also noting on Twitter it was her first full day at the office since having her first baby two weeks ago. The hiring does create a potential issue in the sales arena, especially with current head of revenue Michael Barrett. De Castro and Barrett worked together at Google and multiple sources said the pair did not get along there. De Castro has a lot of work to do for the big payout he is getting and it will be a big challenge for him to turn around the troubled organization. Along with declining growth, search market share, engagement and more, Yahoo also has had a management turnover issue of epic proportions. De Castro will presumably be in charge of making it all better at Yahoo when he arrives sometime before the beginning of the year and is likely to focus on operations while Mayer zeroes in on products. One area of trouble: While she has lavished attention on cultural issues and on the company’s tech troops, sources said most of the advertising and media leadership at Yahoo have had little interaction with Mayer since she arrived this summer. Advertising, of course, is Yahoo’s biggest money maker. The Portugal-born De Castro has a lot of experience here and is decidedly more of a charmer than Mayer. More importantly, he is a very high-profile hire, as well as a colorful one. He speaks a menu of languages, dresses with a lot of style and is a worldwide traveler. I know him a little bit and find him to be smooth and confident, even if a little cagey. All this makes him a perfect choice for Mayer, who is also a former Googler, since she has been considering purchasing a range of companies in the advertising tech space. The most likely candidate of late is PubMatic, which has been in early talks with Yahoo about being acquired. The Silicon Valley start-up would be a solid add to Yahoo’s ad platform offerings, especially if it wants to stay competitive with Google. PubMatic helps publishers effectively manage their display ad inventory, and competes with Google’s AdMeld. 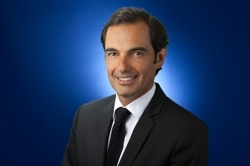 Henrique de Castro Named Chief Operating Officer of Yahoo! SUNNYVALE, Calif. — Yahoo! Inc. (NASDAQ: YHOO) announced today that Henrique de Castro has been hired as chief operating officer (COO). Reporting directly to Yahoo! CEO Marissa Mayer, de Castro will be responsible for strategic and operational management of Yahoo!’s sales, operations, media and business development worldwide. De Castro brings more than 20 years experience leading operations, strategy, partner management and revenue generation for some of the world’s leading brands. Most recently, he was vice president of Google’s worldwide Partner Business Solutions group, where he was responsible for advertising platforms and services for Google’s publisher and commerce partners. Prior to that, he led Google’s media, mobile and platforms organization, where he helped to grow the business significantly. Prior to Google, de Castro spent two years at Dell Corporation, where he managed sales and business development operations across Western Europe. He has consulted for McKinsey & Company, where he advised numerous clients across many different industries. His career also includes senior positions in private equity and advertising businesses. De Castro will join the company on or before January 22, 2013, or as soon as he has satisfied his obligations to his current employer.